Today, keynote speakers are all focusing on the importance of customer service and satisfaction as the critical components of a successful business. Tom Peters, author of In Search of Excellence, calls it the "competitive edge." Developed and presented by customer service experts, this seminar teaches ways to work easily with others and create a more pleasant environment. We've drawn from what is working in companies all across America. You'll learn ways to communicate keeping your composure under stress, and much more. This customer service training will help you train yourself, your staff and your organization not only to head off problems, but also to rise to a level of service excellence. Increase the return on your customer service dollars. Make your customers feel important and appreciated. Reduce stress and turnover in customer service jobs. Become a master in the art of listening. Say "no" and be firm without antagonism. 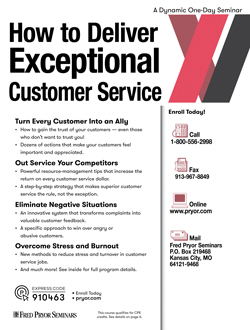 Set aside just one day, and you can learn how to turn every customer into an ally, out service your competitors, eliminate negative situation and overcome stress and burnout! 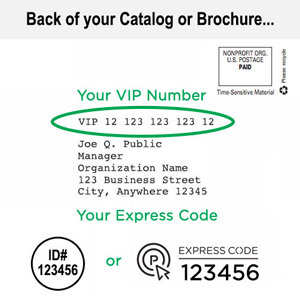 Customer service representatives, sales professionals, sales and customer service supervisors and managers, marketing professionals and managers, front line workers — anyone and everyone who comes into contact with customers! You are familiar with your organization as an “insider,” but your customers judge you by their contacts and your “up-front” operations. Your organization through the eyes of the customer. How to handle the inherent frustrations of heavy customer contact. Why the choices you make with each customer contact are so important. The very best customer service personnel can’t be effective without internal support. By promoting team-building techniques, you can reduce stress, increase staff satisfaction and offer your customers the highest level of service. What you say may not be what the customer hears; the best intentions can be misconstrued through poor communication skills. You’ll learn guidelines to communicate your message clearly, avoid misinterpretation and project a positive image of your organization. Are you hearing your customers clearly? Listening is not a passive activity, but a skill that requires concentration and practice. You’ll learn how to really understand what your customers are saying. Every customer must place a certain amount of trust in the people and organizations they do business with. You’ll learn how to win your customers’ trust and build their feelings of loyalty for a long-term, satisfying relationship. Often, the only connection with a valuable customer is the telephone. You’ll learn how to combat the depersonalization of phone communications and be as effective on the phone as you would be face-to-face. An otherwise positive day can be destroyed by a single difficult customer. Worse, the difficult customer can break your concentration, raise your stress level and rob you of your effectiveness with other customers. You’ll learn how to deal with the difficult while maintaining your professionalism and sanity. The right and wrong ways to say "no"